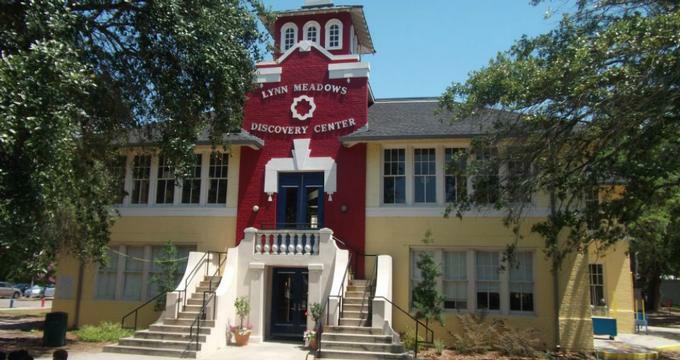 The Lynn Meadows Discovery Center is located in Gulfport, MS within a renovated elementary school and is an architectural exhibition in itself. The center comprises 15,000 square feet of indoor exhibit space, a Viking kitchen, 6 acres of outdoor exhibit space, a large theater, and other facilities for community use. The discovery center was opened to the public in 1998, and features numerous indoor and outdoor exhibits designed for hands-on learning. Spanning the complete height of the Lynn Meadows Discovery Center, the Super Colossal Climbing Structure simulates the sea and encourages children to reach for the stars. The exhibit also acts as an axis for others, and allows visitors to travel from floor to floor. The What It's Like to Be Me exhibit provides a better understanding of differences and disabilities. Interactive activities help kids better relate to challenges some people face completing activities and everyday tasks. Bear Camp Bayou is designed for the museum's youngest visitors, with books and toys that are suited for the important early years of development. Children can play house, build with large blocks, put on their own puppet show, or just relax in a giant nest as their parents read them a book. At the Dolan Avenue Depot, children can step back in time to when transportation by train was popular. Kids can pretend to be an engineer with props and costumes, or choose to be a passenger aboard the locomotive. In Art Knows Anything Goes, visitors are encouraged to explore their creativity with educational and fun art projects. These projects frequently relate to historical events, holidays, or special activities taking place at the Lynn Meadows Discovery Center. To Market, To Market offers children a chance to fill their carts with bread, seafood, fruit, and more at this real Mississippi grocery store, or role-play being a cashier. The WLMDC-TV exhibit gives kids a chance to star in their own cooking show, broadcast the news, or watch themselves kayak down Wolf River. Children can learn about the value of hard work and life on the Mississippi Gulf Coast at The Port, where they can operate a crane to fetch bananas or drag the Gulf for shrimp. It’s A Matter of Science teaches about sight, sound, motion, mass, and safety among other topics through hands-on activities. Visitors can also learn about local history at the History Hotel. In addition to the indoor exhibits, the Lynn Meadows Discovery Center has several spaces for outdoor play. On the Green offers views of the Gulf of Mexico and an array of outdoor fun. Visitors can create a tune in the Musical Garden on instruments planted in the ground, use the tree cookies to build, view local birds and barrier islands at the Ship Island Lookout, or paint with water on natural slate. At Bear Creek, visitors can climb aboard a child-sized train or set up camp in a log cabin. The Tree House Village, designed for imagination and habitation, lets kids of all ages play in the tops of 100-year-old trees. A real-life subdivision in child-sized proportions, Kids Street offers loads of fun for children. Houses in the outdoor exhibit are built to give children a glimpse of what goes into construction.